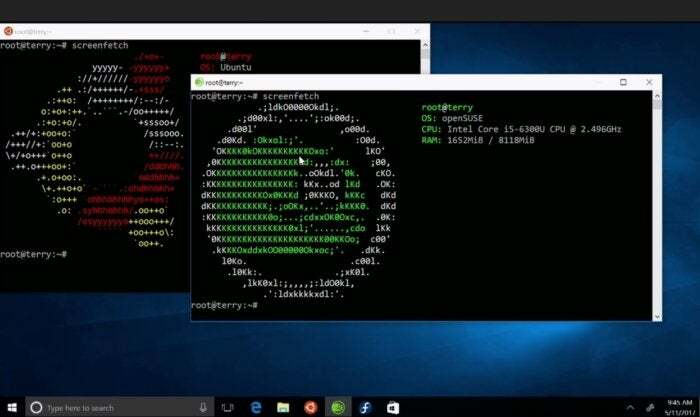 Fans of Windows Subsystem for Linux (WSL) love that it provides a native Linux experience, command line and all, to Windows users. But not all have been fans of the choice of Linux distribution—Canonical's Ubuntu Linux—and thus have launched projects to swap out Ubuntu. ALWSL is one such project, and the Python-based WSL Distribution Switcher, which provides automated access to no fewer than 10 Linux distribution userlands, is a more sophisticated approach. Now Microsoft has decided to provide an official distribution swapper in WSL, per an announcement at Microsoft Build. The plan is to keep Ubuntu as a supported distribution, but add Suse Linux and Red Hat's Fedora as supported options. Microsoft will use the Windows Store as the distribution mechanism for the different distros. But most WSL users would likely have been happy with a command-line tool, which they may yet ask for as a means to automate the process of setting up or switching distros. Microsoft likely has more than convenience in mind. The Windows Store is a mechanism for trusted software distribution, so providing Linux distro userlands for WSL through it guarantees that the code in question isn't dodgy. The above-described third-party tools let users switch between distributions on demand. The revamped WSL will not only allow that, but also allow multiple distributions to run side by side. Distributions can also be installed to a drive other than the system drive. The revamped WSL features will be available "in an upcoming Windows Insider build," according to Microsoft.